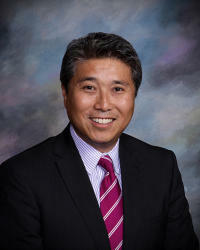 Andrew B. Kim currently serves the Comal Independent School District, a fast growth school district that covers 589 square miles from San Antonio to New Braunfels, as the Superintendent since 2012. He has been in education for more than 20 years serving in multiple school districts from Dallas ISD to Comal ISD. His teaching background is in English as a Second Language. He has previously served in the role of Deputy Superintendent, Assistant Superintendent, Director of Professional Development, Principal and Teacher in multiple school districts in Texas. He holds a Masters in Educational Administration from the University of Texas at Austin and a Bachelor of Arts in Medieval Studies and Classical Civilization from Fordham University in Bronx, New York. He is married to Amber George Kim who is a special education administrator. They have three children who attend the Comal ISD schools. Andrew B. Kim believes in teacher quality and engaging instruction that meets the needs of today’s learners. A quality teacher will be the key difference. He believes that public education must adopt an entrepreneurial attitude and focus on continuous improvement.